The Pilatus PC-24 is like no other business class jet in the world. Its impressive take-off and landing performance allow it to access more airports than other jets its size, all without compromising jet speeds or luxury. The Pilatus PC-24 follows along the basic principles of comfort and service for which PlaneSense has become known, yet it offers much more than other business class jets of its size. The comfortably appointed aircraft’s outstanding short-field performance allows it to access substantially more airports. Built on the success of the Pilatus PC-12, the PC-24 complements many of the features already appreciated by PlaneSense® fractional share owners, such as the flat floor, which provides more comfort than the narrow footwells of similarly-sized business jets. At over 500 cubic feet, the cabin is substantially larger than many aircraft of similar size, providing generous headroom and legroom for even the tallest of passengers. The large, spacious cargo door is unique to a jet of this size and the configuration of the cargo area allows passengers to access their belongings from inside the cabin during flight. Your browser does not support the 360° Interactive Tour. Please view the image gallery instead. The unexpectedly spacious cabin of the PC-24 comes to life in this virtual tour. 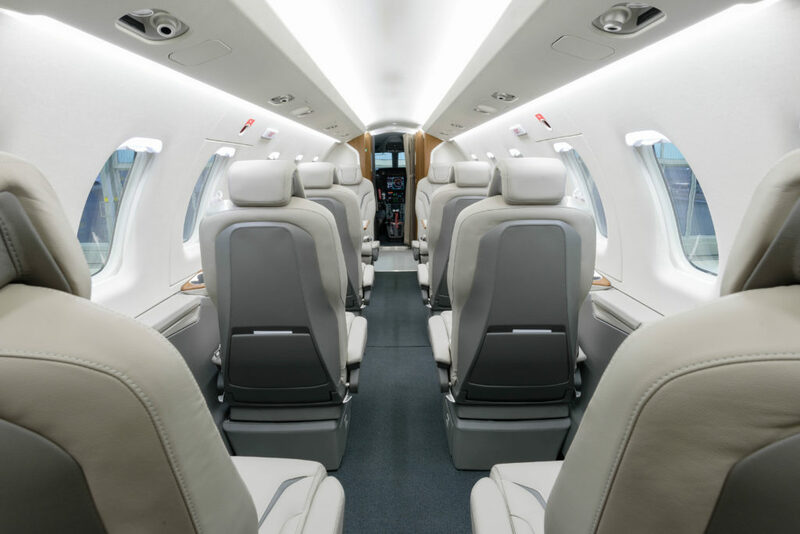 Take a look inside and imagine how luxurious your private flight will be as you relax in comfort aboard one of the most technologically advanced jets in the industry. Powered by Williams FJ44-4A engines and its unique Quiet Power Mode™, the PC-24 will have the ability to power its electronic systems with economical energy without the need of ground power or a large on-board auxiliary unit. By including the Auxiliary Power Unit (APU) in one of the engines for on-ground heating and air conditioning, the aircraft becomes lighter and more versatile. These high-tech solutions also make the aircraft more fuel efficient. Rest assured your PC-24 pilots will have the most advanced array of avionics in the cockpit to ensure a safe and comfortable flight. The thoughtful layout of systems ensures pilots are working within an efficient and intuitive cockpit that provides them with full situational awareness throughout the flight, enhancing communication and navigational capabilities while also preventing fatigue. Another feature carried over from the Pilatus PC-12 is the trailing-link landing gear. Many who have flown in a Pilatus PC-12, or watched as one was landing, are impressed by how smooth the landing felt and looked. These gentle landings are attributed to the skill of PlaneSense’s highly trained pilots, but they are also due in part to the aircraft’s retractable trailing-link landing gear. This advanced landing system is why the PC-12 is famous for comfortable landings even on the roughest surfaces — including grass, dirt, and crushed coral. The Pilatus PC-24 is equipped with the same landing gear design for the same smooth landings no matter the runway.